Do you work for Oracle PeopleSoft? Learning about PeopleSoft? We can help. "Peoplesoft is a great way to record hours "
"PeopleSoft Financials as Enterprise Finance Management"
I have worked on PeopleSoft as a techno-functional analyst and now I am an end user managing the general ledger of a bank in PeopleSoft General Ledger module. It is a very user friendly application with simple user interface and neither complex or flashy to use. Also the delivered functionality provided by PeopleSoft is very much efficient to use for any multinational company and the maintenance of the product is very cheap as from the latest version 9.2 it doesn't require a project to be carried out to upgrade to newer version. there is nothing much to dislike about the product except the fact that it is not well integrated with cloud. But one thing good about ot beign on cloud is it can be customized to the level a user wants. I use PeopleSoft for core accounting management through PeopleSoft General Ledger. It has a very good accounting functionality with well manageable functional configuration. It also has good reporting functionality for audit purposes. "Easy to Use Accounting & Payroll Software"
I have been using PeopleSoft at multiple companies, and I am always satisfied with its ease of use, user-friendly layouts, and reliability. I currently use PeopleSoft primarily for entering and processing payment for invoices, as well as to keep track of time, benefits, and to receive pay. I very much like that the platform is consistent across all systems I am using (HR, Payroll, Finances, etc) so I can easily navigate regardless of what role I am taking. There is not much I dislike about PeopleSoft. The software could offer more personalization, such as custom layouts, colors, fonts, quicklinks etc. However, it does a fantastic job for being such a global tool. Action items are easy to identify. The sheer amount of information that can be stored and shared across departments, agencies, etc. makes PeopleSoft a valuable database system. The sheer amount of tools available via the PeopleSoft software is enormous. It is great to be able to use one platform for all my financial services and human resources needs. Being able to streamline out payroll approval process has resulted in fewer payroll errors, and thus, reprocessing. This in turn lowers are expenses and makes for happier employees on all ends. Peoplesoft is very customizable. I've used Peoplesoft at two separate colleges and each college was able to really customize the program to fit their specifications. Paychecks are easily accessed, as are other tax forms, and HR management forms. Having one kind of system to manage all the items we have makes it easy and consistent for users. Additionally, some of the menus are a bit confusing. In the HR system, it is difficult to find true balances of vacation, enter in time and request vacation/time off. It makes it frustrating as an employee. I would say that if you are looking at PeopleSoft, consider what you're hoping to get from it and then customize it to your needs! We have many students that apply, so it's nice to be able to have a system that can handle the number of students we have. Additionally, by integrating the HR system and the application system, we have less software to manage and update. ""Easy to use payroll software""
The aspects that we like most is how wonderful is the customer service. They are really patient and will explain things to you until you understand them and will also help you answer any questions. They also rush to inform you if your refund request was approved or rejected or if you need to provide additional information. Excellent. It is a software completely easy to use and direct. We can process personal claims quickly and effectively in a matter of minutes. It's everything we've been waiting for a long time. We really do not have anything to say against this product. It is a program that has saved time and money for our company PeopleKeep allows employees to easily add health reimbursements at the touch of a button. The platform is simple and very easy to use. The chat feature is useful if you or your employee may have additional questions. If you are looking for a platform with these features this is what you need, we highly recommend it. We needed a system that would help us administer our QSEHRA, so that it would save our administrative staff time. We can use PeopleKeep instead of dealing with the additional cost of the hours that we would otherwise spend dealing with all the paperwork. Without hesitation, that impelled us to change to this wonderful software and leave behind the previous one. I like that I know how to use it and that it gets the job done. 1. This is the slowest solution. It takes YEARS to add a new row to your expense report. 2. It is INCREDIBLY finicky. Don't think about entering in two amounts at once or hitting the backspace button one too many times. Best case scenario... you get the wheel of death. Worst case scenario... you lose your entire expense report and have to start over. 3. It's not very intuitive. I have been using it for 2+ years and I'm still not confident how to adjust approved reports or how to find things. And I work in IT software. Honestly - If your using this for Expenses, I would look elsewhere. We use this as a platform to complete financial expense reports. I guess it's itemized which makes it easier on our team for auditing. This system is a great tool for tracking hires, applications, candidates, and most importantly creating offer letters. It makes hiring process easy in terms of having everything under one roof and everything documented and tracked in a system rather than manually. It is a one stop shop but this does not qualify it to be a great ATS tool. It is so old and outdated. There is no click back button and if you happen to click back, you will lose everything. It is slow to process an action as simple as accessing a requisition. The wheel just keeps circling in the middle of the screen for a good 15-20 seconds. It needs Adobe Flash to function and if for some reason Adobe is not running properly on your PC, then good luck! In today’s technology, this ATS cannot be accessed via mobile and not web browser friendly either. In terms of accessing via Chrome and wanting to download a resume or an offer letter, you will be unable to do so and you will get a loading error option. Next step is to save the document in order to be able to download it. This is not the case for IE as it allows you to automatically download the document without the extra step provided within Chrome. Great for offer letter creation and having all applicants in one place. "Peoplesoft - stuck in the past"
Interface is very user-friendly. I find it easy to navigate between sections and various areas. Compared to our previous software, I feel like this program has many more functions. So far, we have been able to consolidate a laundry list of tasks into one platform. I specifically dislike the timesheet area. It is very confusing. There are too many tabs and sections. I do not like the "waterfall" capability in which leave time starts with comp and uses that first over annual or sick time. Be patient. It takes time to learn and navigate the system. Overall, it seems to be useful and has the potential to help your organization handle various needs under one platform. Enables users to manage time, payroll, and employee leave in one area. 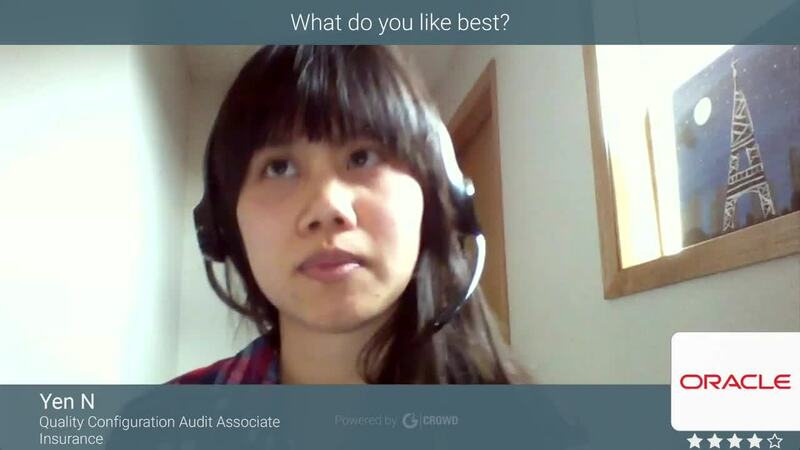 It simplifies HR tasks and allows for employees to feel more in control of their profiles. PeopleSoft is a software made for every company. Every department is now connected via this online PeopleSoft portal. Performance can be tracked and hence actions can be taken to improve the employee's performance and efficiency accordingly. The company can be well managed and administration becomes easy. Also, due to various checks and approvals in between, chances of theft are almost removed. PeopleSoft is an extremely important tool for businesses. A notification can be sent to employees, need for signatures could be reduced and as everything is online, timely and accurate information could be shared among all. At Deloitte, I can assure you, our company may have saved thousands of trees just by saving paper and using PeopleSoft for any announcement, memo, notification or report. Along with this, one of the most important feature is the accessibility from anywhere whether in or off-office/campus. Many a times, I have seen PeopleSoft's software getting crash if there are a a lot of users logging in/using the software at the same time. This causes a huge problem in terms of communication as well. As the company I'm working in employs hundred of employees throughout Pakistan, the software slows down and needs to be refreshed. Using PeopleSoft on your handheld device is also unpredictable. Sometimes it works perfectly on my phone and sometimes, the software can't be accessed on my mobile phone. This creates uncertainty and unreliability. The first time I was made aware of PeopleSoft was when I was in my university. PeopleSoft was an excellent tool for students. Everything relating to our academics could be found on this platform. CGPA, finances, enrollment etc. Any announcements or assignments by our teachers could even be found here. It was a universal tool for all students. "A bit of a learning curve"
Once I learned how to use the software, I was able to run queries and reports with ease. I like that the purchases and expended money are all easy to keep track of. There is a learning curve and it required extensive training for me to truly understand how to use PeopleSoft. Sometimes it takes a while for the reports to load, especially when there are a lot of other people trying to run reports at the same time. The text on the reports could be a little bit bigger, but that's just my preference. There is a learning curve and it helps to have someone who is an expert in this software to train you. Tracking our budgets and running requisitions. I enjoy the fact that it is easy to go back and take a look at requisitions that I have run that have not been completed. I like that the search functions on Oracle CRM are so vast. There are a variety of ways in which you can search for a particular parent account, account relationships, and the contacts within CRM. Furthermore, there are highly specific search methods to refine searches when utilizing these functions, which is very helpful when there are numerous accounts and customers that could appear from a particular search. For example, you can search for accounts in different locations, regions, countries, etc. which is a very important distinction when making account relationships. Lastly, I like how there is a recently viewed tab in CRM that allows me to pull up any of the recent accounts I was working with -- this helps me cut down quite a bit of time in the day as I am frequently working with the same few accounts. I think there are some aspects to Salesforce that CRM could adopt. For example, some sort of audit history that is more specific to a recent trail of the modifications that have been made. I know there is already this component, but as someone who frequently looks into audit trails, I think this aspect on Oracle CRM is still lacking. I use the customer relationship management (CRM) component of people soft to identify different account and customer relationships. In addition, I also look into vendor, customer, and representative relationships on CRM. CRM holds all the data to quickly and efficiently search for these relationships as well as reliable holds this data from the various companies in one place. "Never meant to be an ATS "
PeopleSoft as an Oracle product can be customized to meet the needs and workflows of an organizations, which allows the system to work for my company's needs. When the system has issues it usually does not impact the candidates applying, and it more troublesome for the internal user. PeopleSoft does not appear to have been designed as an ATS. Out of the box the ATS provides very limited service, and has had to be heavily customized to meet the needs of recruiters, compensation, finance, and our managers. The process flows of position creation is not intuitive either. Tracking of references and on-boarding steps are not tracked in the system, and this has become a standard characteristic of modern applicant tracking systems. Lastly, PeopleSoft is not mobile friend and this is a huge hit in today's market. Much more advanced products out there, but these may in fact be more expensive at the same time. A good all inclusive HR System, but from my perspective the lack of mobile features sets PeopleSoft behind the other popular systems. Customization will require IT support from your own IT team or outsourced teams as this can not easily be done without coding. 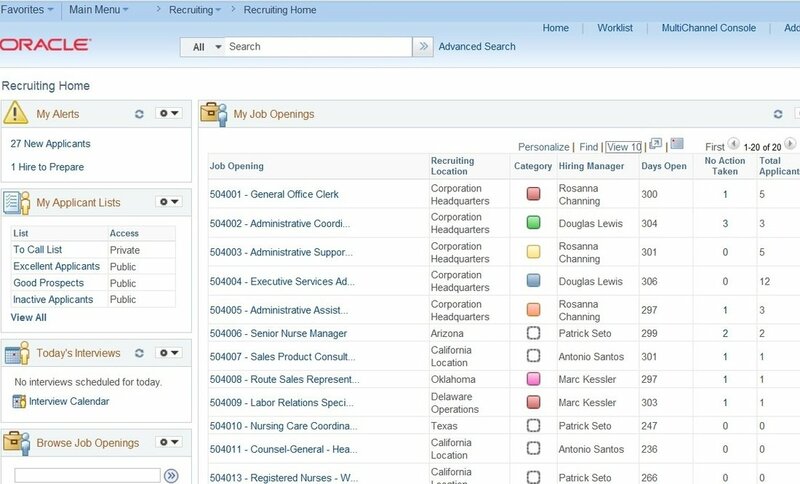 Receiving over 1000 unique applications a month the PeopleSoft system definitely allows us to tracking and organization applications based on job. As a growing hospital this is crucial for us where just 10 years ago paper applications were still accepted. "Great to find information you need but complicated to use"
I work at the Chapman library, and many times we need to confirm that certain patrons are affiliated with the school. I like that I can use PeopleSoft to see if someone is a student or faculty. The best way to see a student's account and what classes they are registered. It's that fastest way to find a member. The visual aspect of the program is my least favorite. It seems outdated, so I try not to use the program if I can find a person's record another way. I also think PeopleSoft should have a tab that says "Staff" to indicate that's where one can input a staff ID number. It took me a long time to figure out it's under "Affiliations." Since it's the summer, school is out until that fall. The campus only allows current students, faculty, and staff to check out library materials. PeopleSoft updated patrons records right away, so the library can use PeoplSoft to see if certain patrons are no longer part of the school. We've had people wanting to check out materials but have left the school or have no proof of being an alumni, and we rely on PeopleSoft to check all current registrations. This has prevented the library from allowing privileges to a non-Chapman patron, which can risk the library having additional missing materials since non-Chapman patrons have no obligations to return the materials. PeopleSoft provides many useful application/features under one umbrella.New version of PeopleSoft Also support mobile based functionalities which are very useful .Software is very flexible and can be customized easily with the help of small expenditure. PeopleSoft has FSCM ,HCM , EPM ,CS and many more suites which can be used all together or can be used with integration to other software indvidually.It supports its own language which is PeopleCode both Procedure and Object Oriented feature. Suite makes HR Process , SCM Process , Accounting and Reporting easy. There are many competitors in the market such as SAP ,Workday , Fusion, Oracle Cloud, Service many of them are launched later as competition to PS but still PS has survived and doing well. it has less options to change the Look and feel (Theme ) specific to users. PeopleSoft is a best suit as an ERP to manage any organizational data efficiently. We are managing internal as well as many client in house projects with help of PS ERP. "I am a lifelong PeopleSofter"
PUM and the advances in underlying tech, the dedication to the UX, continual advances in improving ease of administration and configuration. 3) The patching process for individual components with oPatch can be confusing, especially in a non-Oracle based shop. It's still a great product - like anything, it's the right education and being able to impart that to others, and having it set up and used correctly. 1) Being able to implement and manage/execute on all the backend necessary to run a higher ed business model in an integrated setting from a single vendor. 3) Relatively trouble-free and easy in-house Payroll processing from data management to check and advice printing and registers with reconciliation. "PeopleSoft review for Institutional HR and Financial Use"
The ability to run many different types of financial reports and the ability to have both financial and HR applications in one portal. You are able to easily access paystubs, tax forms, update information, submit expense reports, etc. I don't feel like this system is very user friendly especially when it comes to running financial reports. It can be very confusing and the mini-manuals are long and confusing as well. Processes to run reports and find personal HR information could be much more efficient and simplified. If your institution offers trainings on downloading and understanding financial reports, it would be a good idea to attend. The mini-manuals are not helpful and can cause more confusion. Easily able to track employees time and download real time and detailed budget reports or many different kinds. These reports have been able to address many different financial questions. We have $58 million dollars in grant funding so the ability to run these reports is important. "A solid service with clunky interfaces"
I like the full time and absences service, the per paycheck breakdown, and the ability to see the individual benefits that I am being given. It is also nice to be able to enter hours directly into the peoplesoft system. I dislike the mobile functionality. When entering hours into the timesheet from a mobile phone it can be glitchy. The views are very old looking and it looks fairly ugly for a user-facing portal. I recommend it to larger companies who would be saved a large amount of time by having a very clear payment and benefits portal. It would also benefit companies whose costs are largely labor driven. from developers or landscaper much simpler. It solves self-logging of payroll hours and gives people access to a full list of benefits. When it pays out, the payment details are very clear and reduce questions and uncertainty from employees. "One Program for Many Task"
The ability to customize your screen and favorites menus is one of the things that make the access easier. I love being able to use the time keeper function to enter ad submit time attendance records for payroll virtually anywhere. The multiple screens for reports. There to many screens to get to generate a report, and then to access the reports. This could be improved by creating easier ways to run quiereis and make this portion more user friendly. Create a favorites list for easier access to the most used functions. Some functions require multiple screens, and by creating a favorite it will take you directly to the wanted screen for the function that you choose. Learn how to use the reports and run queries. Once you are able to set up your features and functions, using this program will be easier and more efficient. Time keeping, creating purchase orders, following up with receiving, processing payments, running reports, and many other tasks needed for daily operations. I really like the "My Favorites" feature because there are a lot of tools in PeopleSoft but I don't utilize all of them. Thus, "My Favorites" feature makes it easier for me to access the tools that I use. I dislike the way it looks. It looks like it hasn't been updated since the 2000s. It's sometimes very difficult to find the tools that I need. I have to click 10 times to get to the tool that I want. Also, it is very slow. Whenever I am doing a step that involves multiple lines, it takes awhile for the system to process, which gets annoying because I have a lot of steps to go through. Lastly, if I make a mistake, it is difficult to make edits. I will have to undo everything and redo everything. Needs to update its product. Make it more modern and make it easier to access certain tools. We use PeopleSoft to do allocation. It makes Allocation expenses and revenues a lot faster. "Oracle PeopleSoft is such a useful tool in a university setting!" I love the different tools within this one software. It offers administration, students, and staff the ability to use features within one single location - and this made it easier to assist students and staff with course enrollment and grades. For example, as an administrative assistant, I was able to check on transcripts, grades, and course enrollment (in addition to course planning and determining outstanding requirements). The outdated interface and the inability to backtrack a task in case you make a mistake. Making an error means you must start the task all over again. Working in a university registrar, PeopleSoft made it possible to communicate with different departments of the school, like the Admissions department. It made inter-departmental communication easier and more efficient. "Peoplesoft is good but not great"
People soft has a lot of features that allow your job to go much more efficiently. This would include automated features that allow you to enter information more efficiently when it comes to repetitive information. Even though there are areas of this software that have nice automated features, there is still too much manual processing that has to be done in this system, or at least the way my company has this system set up. There are certain areas of the system where it wont allow a more efficient process and thus makes the job take longer to perform. Think hard about whether to use peoplesoft or not before you consider spending the money for this software. This is definitely a system that you need to count the costs before you consider installing a system that may or may not be efficient enough for you to do business with. Peoplesoft is our main accounting system that we use in my company. We use this in order to track and maintain records in order to be prepared for any audits that may come since we are considered a non-profit company. Peoplesoft has helped our company to increase productivity and manage an ever growing staff with ease and efficiency. We use this software consistently for applicant tracking and candidate evaluations. It has been a great help in determining who is the right fit for our organization. We started with 50 employees and expect to be up to 900+ by year end. Peoplesoft has grown with us throughout the process. I'd like a lot more tutorials and training on the available changes and updates. They are constantly adding new aspects and we would love more training on each roll out. In office demos would be a great help. Our rep changed in the last year and we have yet to meet her. Stay on top of the new features. Reach out to your rep consistently for demos and training. The ease of use for users makes this a great software for large and small companies alike. Our company has recently moved to the use of a DUO authentication which requires the user to be on company property to access the software. While it is not ideal for employees, it does create a more secure platform for sensitive materials. The software can be slow on occasion, depending on how many users are logged in. Duo Authentication is not ideal when working off-site. Our staff has found the software to be user friendly. Employees are able to access payroll and hr records on their own. In addition, the paycheck modeler as shown to be popular with employees who are making changes to their tax situations, contributions, insurance, etc. "PeopleSoft in Technical Writing "
I like that the functionality is easy to follow and use. It's layout if very neat and easy to look up things that the user may need. It helps with making the technical writing aspect of my job easy. The navigation is laid out in a logical order, and when I go to grab screenshots to show our viewers how to navigate the system, everything stays in alignment with how it should. I don't like that you have to wait until you are ready to submit a requisition to find out if you did it right and if it will go through or now. Another one of the things I don't like, and it's not really on PeopleSoft, as much as it is on my own company, but I don't like that it is extremely difficult to do certain things without clearance. Again, mostly on my company, but it took about 2 months just to get cleared to do work on the DAL so I could update a training course and write a manual about all of the features of this particular aspect in PeopleSoft. This is one of the best software experiences I have had when it comes to business. It was easy to learn and navigate, therefore making it easy to teach to incoming employees and to write training manuals for. It is nice coming to work in the morning and knowing that all of my data I had worked on in the last week will not randomly go missing. We use PeopleSoft to track budget and keep all projects in line. This has come in handy when it comes to purchasing and payroll. I mainly use the software to write training manuals, webcourses and to teach co-workers the ins and outs of the software and the new features that may be presented in upgrades. "Peoplesoft assists in accounting but could use improvements"
I like that Peoplesoft is pretty easy to use and only requires a few clicks to get the information I am seeking (most of the time). Peoplesoft is useful to our business because it helps find unapplied money. Instead of not showing in the policy record/transaction history, Peoplesoft allows us to view where the money is sitting before it is applied somewhere. Therefore, it is not "lost," but just in suspense, and we can move the money to wherever it needs to go as long as the money is good. I am not a big fan of the interface of Peoplesoft. It could be improved. I have to open an Excel spreadsheet to see if there is money in suspense and Excel spreadsheets can be difficult to read sometimes. It would be better if the information was listed in a way that was easier to read. Also, not too familiar with customization options. Peoplesoft is pretty useful for its function, but could be improved. I primarily use Oracle Peoplesoft to obtain information for accounting. For our business, if there is money that has not been applied to a policy/contract (i.e. money is in suspense), the money would show up in Peoplesoft. I am not too aware of some of the other functions besides Queries for accounting purposes. "Full Bodied Programs with Ease of Use"
Peoplesoft products are like soldiers, they are reliable, there are hardly any coding or programming glitches, and they are reliable for the long term. Have seen initial versions of programs in our company last for many many years with minimal code updates. The only thing that slows the performance usually is server speed. Can't think of too much - I guess the graphics are a bit dull/outdated, and there are some aspect ration issues with zoom, and filling the screen space that could be tweaked, but overall very comprehensive use. Multi-office capabilities, real-time file updates, file sharing, and reporting functions. Multi-version file outputs (PDF & excel). We need all of the accounting to be 100% accurate and in real time and this does this except for some of the reports which take an overnight batch process in order to update. I dislike the change from the title vendor to supplier. I had no idea what was going on when I logged in after the update and that’s frustrating. With the new STARS application, we are getting away from EPM which is not necessarily very initiative and going to this new platform which is easier to use. We are able to do most of our information collection, accounting and HR/payroll in one place. I enjoy using Peoplesoft quite a bit. The use interface is relatively easy to use, and it accomplishes all that I need it to do for me. I would say that in this era of technology, while in many ways simplicity is appreciated, Peoplesoft could stand to be more dynamic in its use. There is far more analytical uses that could be derived from the software. Fully Evaluate what you want to derive from your people management systems. Making sure that you have the right system that fits the needs of your organization, and that it does properly anticipates the needs of your company will be crucial in this decision. Peoplesoft absolutely can meet the needs of may companies, which speaks to the intelligence and the success of most of the products within the Oracle framework. I would say that Peoplesoft is one of the top contenders for people management. 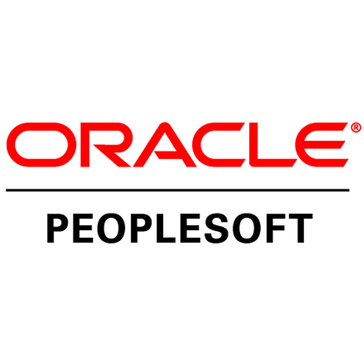 Peoplesoft handled our human resource and talent management functions. "Easy to use, centralized platform for all of my HR needs"
Accessibility to my information is key for me. I love that I'm easily able to access and edit my payroll information (i.e adding/removing accounts, increasing/decreasing percentages)and my benefits information with PeopleSoft. Its also easy for me to check on everything that pertains to my (i.e tax information, retirement contributions, MBTA pass). There have been some internet connectivity issues with PeopleSoft lately and when it comes to payroll it only lets you make 1 change per day (inconvenient if I'm trying to update and get it over with). I never have to reach out to my HR department for simple things like checking what benefits plan I'm on or how much of my paycheck goes to my checking vs. my savings. It saves me a lot of time and is great because I can access it whenever. "User of PeopleSoft for 12 years - Great Product"
Every thing in PeopleSoft and its user interface and design. Its coding features are very good. Support for Web services are increasing by version. Also, the Tool set is elaborate which gives options for development. Easy to customize and develop new modules and functionality for the user. The reports are not integrated tools in the PeopleSoft. It uses an external tool set like SQR, Crystal Reports. BI is developed but does not satisfy all reporting requirements. REST webservices support only XML and JSON. More support is still required. Great Product with lots of features and ease of learning. Entire Core HR and Payroll applications in our company run on PeopleSoft. "ePro and Purchasing in 9.2 in IaaS environment." Shared responsibility for supporting the environment system with OCMS (Oracle Cloud Managed Services) is helpful when dealing with hard to track down issues. It can take some time to get the necessary resource to troubleshoot but at least we're not alone as we don not have a development resource for the application. Support services for cloud environment is confusing to navigate. Depending on your issue or request, you will need to know which support area to assign your request. In many cases your issue or request will be reassigned to the correct group or sometimes even told to open up a case with the correct group. This can be frustrating and time consuming. A single point of contact to assign requests/issues to the proper support group would be beneficial. We use our system to manage our indirect merchandise purchasing, This has allowed us to consolidate purchasing for our global footprint, supporting 700 facilities across the world. Ease of consolidated reporting has been helpful for our business partners evaluating and managing our facilities needs, especially with maintenance and replacement purchases. "Functionaly very strong product but expensive for mid cap companies"
"Makes annual performance evals & open enrollment a cinch"
I love that yearly performance evaluations are paperless now - I can complete my self-evaluation and digitally sign it off before easily and electronically sending it off to my manager. Once she reviews it, I can sign it of and review her portion before our in person meeting in order to know what to expect. The step by step process for renewing or adding/removing benefits during open enrollment is seamless and usually takes me less than ten minutes. All the icons that are pictured within the software are essentially the same. If each icon for varying links were different it would not only be visually appealing but it would likely be easier and quicker to locate which link the user was searching for. This minimizes the number of HR staff needed to re-enroll employees for yearly benefits. I have realized the paperless & electronic aspect to complete annual performance evaluations saves me a lot of time and energy. allows a lot of customization if you have a team that have knowledge in the background programming. it also allows to run in different country and customize it from country to country uses. It allows different users to have access to different modules depending on their department and need. hard to use, and not user friendly. one thing goes wrong and its a chain effect. I do not feel like the modules connect together too well. they do not communication between module making the user needing to input the data in a few different spot rather than just one spot. i do not feel i would recommend this software, since there is a lot of issues that i run into and when i try to fix one issue it usually causes another issue to pop up. I feel that i need to constantly be fixing some issue and is never ending. Also i do not like how this software does not communicate between software, which in turns waste the time of the users. allow to store information for clients in one place and allow to edit the data when ever it is needed. "PeopleSoft helps me a ton." I love that I have one place with a single sign on that I can view tons of important important data. I can update my demographics, benefits, see payroll and much more. I can change my benefits, direct deposit, view my paycheck and even review and record my performance management / reviews in there. Also, I am able to see salary history which is great. It could use a shiny new interface. What we use is pretty outdated and sometimes difficult to navigate. I think buttons versus drop down menus would be more efficient. Sometimes you have to click into many different areas and kind of search around before you find what you are looking for. We offer employees a lot of self service which greatly minimizes outreach to human resources. This benefits time management and employee satisfaction. It takes a great deal of effort to reach out to HR by either waiting on a phone call or submitting a service request when most of those tasks I can perform myself by using the PeopleSoft portal. "Great software, has some catching up to do"
PeopleSoft has a very stable payroll processing which is great. The self-service system alleviates our HR staff from having to answer each and every question. Hiring and staffing has been great even outside of an HR environment. Time management can be an issue for multiple jobs and reporting clock ins/out can be an issue. The overall interface isn't that user-friendly and can be cumbersome to navigate. Be sure to do your research and look into any and all reviews. Overall, it's fairly solid now but in the future it can continue to be an issue if Oracle does not address the issues currently in the software. Servicing HR questions, staffing, payroll processing are done fairly easily.